In the year 2009 when Sir Terry Wogan announced that he was stepping down as the radio two breakfast host, Gordon Brown was Prime Minister and celebrity couple Peter Andre and Katie Price announced their break-up. For Smith Brothers we opened our 7th branch in Thurrock and our Leeds branch relocated. Since 2009, the Leeds branch has significantly improved and is still growing today. Five notable changes include the budget, the number of staffs, the fleet operation, renovations to the branch and their secret to success. When SBS Leeds relocated in 2009, the budget for the branch was £3 million for the year and this has now surpassed £15 million. This has shown an increase of over 500% in just 10 years, which is a significant increase for a branch. The branch started in the new unit with 10 members of staff and now employs over 35. Throughout the years there has been many promotions, showing dedication and the career development of staff to the branch. Smith Brothers Leeds team includes four external sales staff, compared to the one in 2009. We have now employed dedicated Air Conditioning specialist and other specialist roles within the team. Offering a better service was important to the branch so growing the vehicle fleet was imperative. Since 2009 Leeds has grown from three vehicles to ten vehicles, bringing efficient service to Yorkshire. The fleet is now Silver FORS accredited which was awarded back in 2015, since upgrading from the bronze. Overall SBS has held the accreditation for six years. The award is granted all company vehicles usually compromising of LGV’s, 3.5T flatbeds and small box vans. All our vehicles hold the status, meaning that when you place a delivery from one of our 14 depots located in England and Wales such as Leeds, you know that they meet the high standards set by the scheme. Renovations in the 10 years include installing three mezzanine floor spaces, updating the trade counter twice along with redecorating and adding new furniture within the office areas. These renovations happened to offer a better environment for staff to work in and customers to visit. Asking the Leeds branch what their secret to success is, they said that it was following the Smith Brothers promise of stock, service and staff. Making sure they succeed in these three areas is important to their strategy. However, they always want to grow and exceed expectations for their customers and the business. This means that they always want more within the market and never settle for second best. The branch also stated that their secret is down to the loyalty of their customers, without their customers there would be no one to serve. They would like to personally thank you for your devotion to the branch and using Smith Brothers as your preferred Supplier. How are SBS Leeds celebrating? 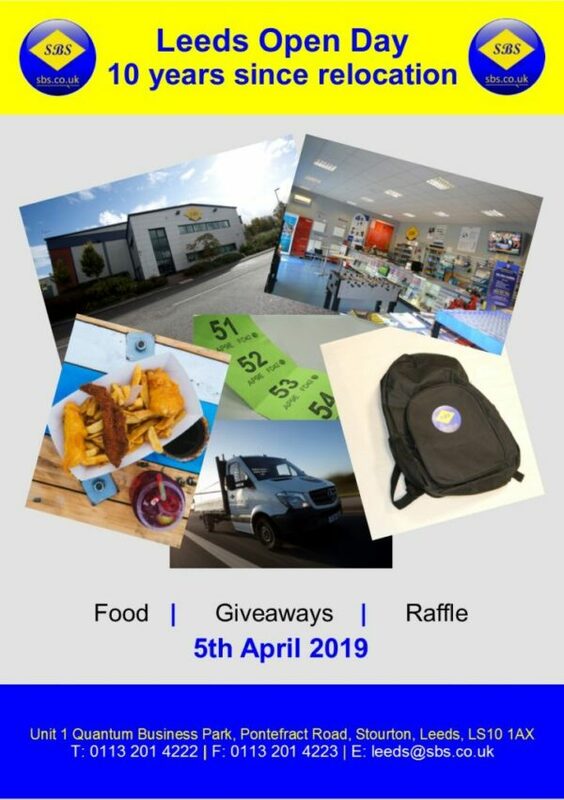 You are invited to join SBS Leeds on the 5th April between the times of 7am – 5pm located on the Quantum Business Park, LS10 1AX. On the day you are promised to food that includes a breakfast menu (07:30 – 09:30) and a fish and chip (11:30 – 13:30) menu. There will also be a raffle and giveaways that will be handed out on the day. If you would like to attend, please feel free to join us and you can contact a Leeds representative for more information.